RMM is quite simply a tool that has made unskilled IT staff obsolete. Prior to IT task automation, a human being of questionable hygiene and even more questionable IT certificate trail would walk to a computer / server and perform maintenance, repair, helpdesk functionality and so on. As businesses started using more technology the IT departments grew in size and influence within organizations because things were far from perfect. RMM software – the likes of nAble, Level Platforms, Kaseya, Scriptlogic, Labtech and so on allowed IT departments and MSPs to centralize and “remote” a lot of the functionality. One person could now roll out software to thousands of workstations across multiple companies. They could keep an eye on all the software and act on problems before significant damage occurred – are backups running, are we using the latest antivirus definitions, are we running out of storage and do we have the latest security updates applied? If the answer to any of those is no, we could address it remotely. This in fact is how ExchangeDefender manages to run a global network without ever setting foot on some of the continents that we have infrastructure on. This technology has been behind the outsourcing of IT management and massive reduction of IT force needed to manage this immense growth in IT infrastructure. RMMs are here to stay. No argument there. However, if you believe that the consumerization of IT is real and that end users and business owners are capable of managing their own phones, tablets and gadgets then you seriously need to look at the opportunity you have here. The current and future workforce isn’t out of Mad Men, it’s not your grandma with the flashing 12:00 on the VCR or an old guy who can’t see his smartphone much less use a keyboard. People showing up in workplaces today have been on Facebook, MySpace and Twitter for years and they may even know some HTML. Yet none of them will be impressed by SNMP traps or VPN advantages over SSL.. because the low level geek stuff we’ve built our companies on is largely too geeky to be relevant. Love the writein comment.. Click on the image for magnification. If we can all agree that virtualization, cloud and mobility are the future.. If we can all agree that the IT decision power and management is going from the IT department to business leaders and managers.. If we can all agree that devices like smartphones, tablets and netbooks are replacing traditional workstations and offices..
.. Is it really that much of a stretch to say that the monitoring of those resources changes radically as does the importance of the data being monitored? In the long, long ago when I started Own Web Now, everyone had a PC. The select few important people got laptops. When those computers went down, people stopped working. It was not the end of the world because most business was still conducted over the phone, fax and mail. Over time people got cell phones, laptops, netbooks, tables. We’re living in the Star Trek world talking to our computers about where we’d like to eat and asking them to remind us to do something tomorrow. With the exception of asking Siri to make you a coffee we’re only short of a replicator. Once upon a time it really mattered if a hard drive was filling up and the client couldn’t send mail. Now if their computer literally explodes they have several devices that can do the same thing. So let’s think about where we are, not where we were.. If you talk to a business owner today his IT concerns are significantly different than those of an IT department. It costs me $300 per month to have an employee park in the highrise office that ExchangeDefender is in. That is the cost of renting the spot, not buying it by the way. The overhead of the office space is even higher as is virtually everything else associated with a real business. Your “real businesses” of the future will have better ways to spend money than overpriced office space and parking spots. Most of the work will be done remotely. You may not have 100% say which device that work gets done on – if the VoIP server is down they will pick up the cell phone, if their computer is down and they need to send a quick email they might have to wrestle an iPad from their kid. Your future workers come with built in Internet redundancy and several business disaster continuity sites (Starbucks, McDonalds, Moes). With a workforce so mobile what is the key monitoring objective? Making sure their infrastructure is working or that their employees are working? As a business owner that manages people working from home, out of the country, or at 2AM there are different metrics I care about that transcend infrastructure. Your laptop got a Gatorade bath because your kid celebrated while watching a football game on it? It happens. $350 later, you’ll get a new one by tomorrow. It happens. Sounds pretty bitchy, right? What if you could just trust each other? OK, joke aside, here is what I want. I want something that would help me both trust everyone, keep them more accountable and let them experience at least some workplace liberty that the technology we have guarantees us: I don’t mind if you work from home but keep in mind that I have a tool that will tell me when you started working, when you went to lunch and how long you spend inside Outlook as opposed to Facebook. 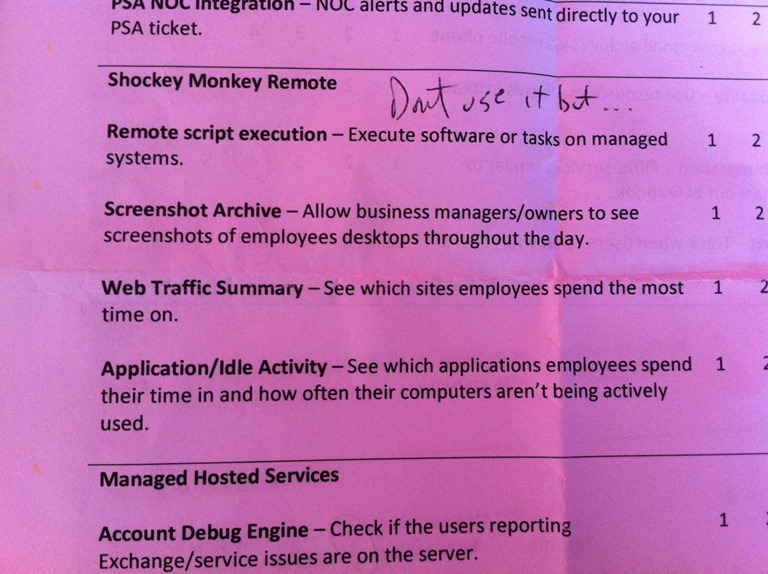 If you run into a problem, I have a remote desktop tool that will let someone assist you. I don’t have to ask you what you’re working on, I can just see your desktop no matter where you’re at. If I just walked into the office I don’t have to wonder what you’ve been up to or waste both of our times with a status report, I can glance over your browsing history and searches today in a few seconds. I can see screenshots of everything you’ve done today and play 4 hours worth of work in under 2 minutes. Our IT guy will get an alert whenever something weird happens to your PC or laptop or smartphone and handle it so you don’t have to waste your time. When I talk about an RMM, I want to think about a remote employee monitor and it doesn’t matter to me if remote is Australia or if I can see you from my office. The key metric of the modern mobile workforce is productivity. Not the technology that once upon a time was far from perfect and needed a 24/7 janitor. Admittedly, while this is something all Shockey Monkey users will have in a matter of months, the commercial opportunity isn’t in trying to sell yet another tool. 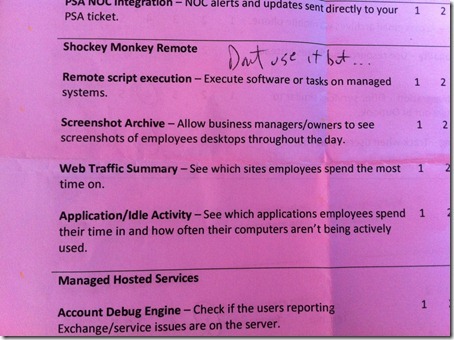 There are plenty of tools that do employee monitoring, activity monitoring, remote desktop help, etc. The problem is that they are written for geeks or HR staff and they cost way too much money!! Imagine an environment where this tool is something the businesses you manage get for free. Yes Mr Business Owner, I’ll give you all of this for free if you let me manage your IT infrastructure you’ve invested so much in. All these servers, workstations, desktops, printers, smartphones and tablets need to be taken care of and it’s cheaper and more effective for us to do it than for your VP to be on hold with some third world helpdesk script reader. While they are leveraging their business remote monitoring tool, you can leverage your remote monitoring tool to generate revenues at a higher rate than others. Business owners and decision makers know they have to have competent IT professionals, they just don’t appreciate all we do all the time. But arm them with the right tools so they can understand how much of their money goes to waste and they might consider their IT as a far more strategic asset instead of a disposable piece of the electronics it really is. In a world where users will manage more of their IT, the cost of managing the IT they can’t figure out will rise while the amount of it goes down. I believe Shockey Monkey unRMM will enable our partners to get into those opportunities in a way traditional marketing and networking will simply not be able to. That’s my story and that’s what I’m investing in. One Response to Reloaded: Shockey Monkey unRMM–What is managed?